About ten men gathered on Tuesday in front of the Cabinet offices to protest the law which grants mothers child custody in cases of divorce. Rami Imam, a Television director, says fathers are allowed only three hours a week with their children when the mother has custody. 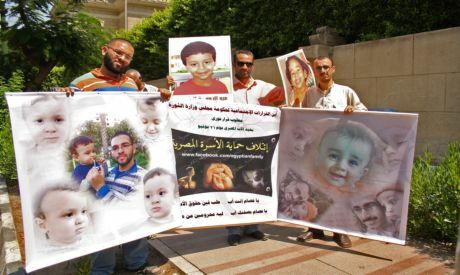 The men standing held a banner reading “Egyptian men’s revolution for changing family laws”. Walid Zahran, a lawyer and the founder of the Egyptian Men’s Revolution Movement, says they are planning on setting up an NGO to defend men’s rights and to fight for changing the family laws which only benefit women when it comes to child custody. Imam, a divorced father himself, says the law automatically gives custody to the mother until the child reaches the age of 15. Meanwhile, the father is only allowed to see his child once every week and for only three hours in a public place. “Neither his grandfather, grandmother, uncles or aunts are allowed to be there at the meeting or any of his half siblings, if any, which practically means the child is completely cut off from his father’s family,” says Imam. The demonstrators believe that the family law favours women over men and demand that the women only get child custody until the age of 7 for boys and 9 for girls as the case was before 2005, when the law changed to rise the age to fifteen. Moreover, men object that the law gives custody priority to the maternal grandmother or maternal aunts before the father in case the mother remarries or cannot take custody, preferring custody to any woman within the mother’s family over the father. The demonstrators have filed a complaint to interim Prime Minister Essam Sharaf who said will look into their case. The men said they will be staging another demonstration on 7July at the ministry of justice to object to the current family law and to the justice minister that men from different governorates are planning to head to Cairo and join the protest. Men of Egypt: watch out! Don't let the feminists take away your dignity and rights, as they have done to American men. Democracy yes; feminism no! Guys do not get disheartened. The first men's rights protest in Bangalore, India in 2004 had 10 people. Today, hundreds protest against the biased system in different cities in India. There are many fathers rights NGOs in India. The conscience of the world will eventually close in on the hateful fraud that the women's movement has long since become - not just from the perspective of the family (which has been radical feminism's most tragic & significant casualty, certainly in the West), but also within the various domains of health, education, employment, criminal law, politics etc. And, for everyone's sake, it will not be a day too soon. Nice one, it is a good beginning to show the world about some plight men are facing in many parts of the world, but I am quite surprised that such a new wasn't censored. This is such a joke! They're crying wolf when they ARE the wolves. Finally, there is a slight wiff of justice for women and they want to take it away?!?!?!? Men in Egypt don't have any respect for women. They expect to be the kings and to get served and for the wife to obey. They don't realise that it's a two way street. These men need to grow up! How are they going to raise any children when they're big babies themselves? Get Real! I am so pleased to be the first to comment! The Global Fathers Rights movement is growing and gaining momentum. Hats off to these men they will have the full support of men and fathers everywhere who are a part of this movement.